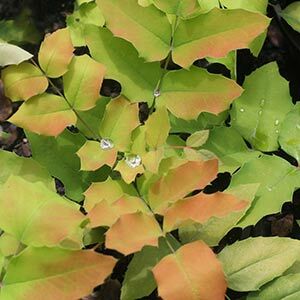 A wonderful plant for semi shade, Mahonia x wagneri ‘Moseri’ is worth the search. Good foliage year round, and brilliant yellow flowers in winter when colour in the garden is at a premium. This is a small upright growing plant reaching only around 1m (3ft) in height, what it lacks in stature it makes up for in year round interest. The clusters of yellow flowers in spring are a treat, and the deep blue berries are also attractive. However the spiny foliage that changes from deep bronze red to deep green as the seasons progress adds year round interest. We know it is a little difficult to find, and it may seem expensive, it is a plant that is a little tricky to propagate. However it is fairly easy to grow. Needing little pruning, a humus rich moist soil in a shaded position is best. 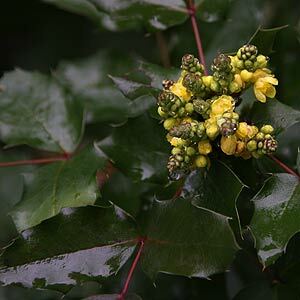 Provide Mahonia x wagneri ‘Moseri’ with some cover from hot drying winds and also the colder winter winds where possible.